Bianca is a wall and ceiling lamp. Designed by Matti Klenell for FontanaArte, it features a diffuser in satin white blown glass, dotted by tiny dints. The wall mount in made frm white metal. 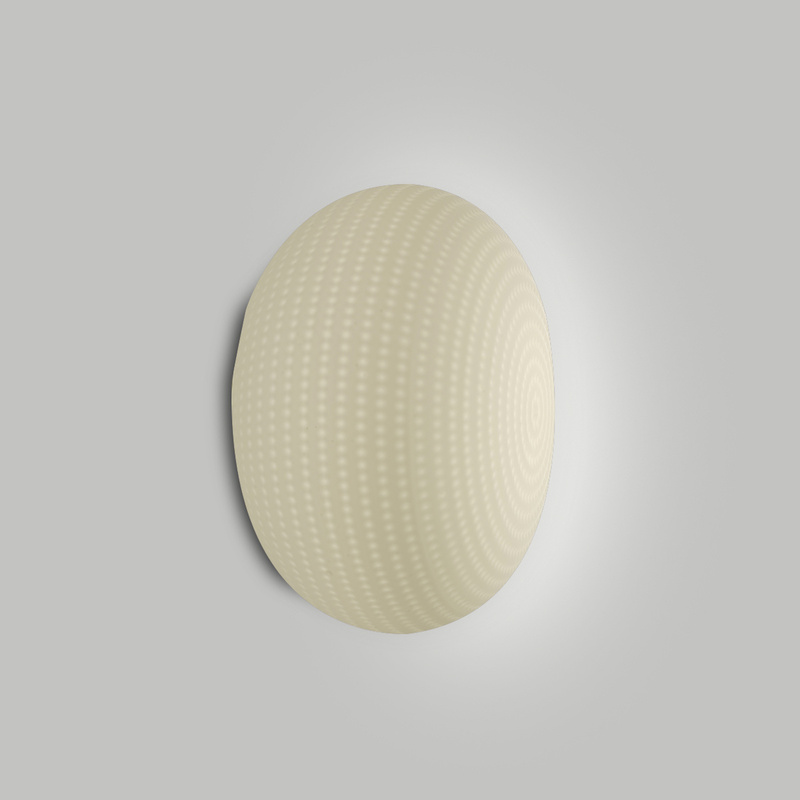 Beautifully balanced, the shape pf the Bianca wall lamp is enriched and made unique by an orderly series of delicate, light grooves that, on the white volume of the glass, look like tiny prints on fresh snow. 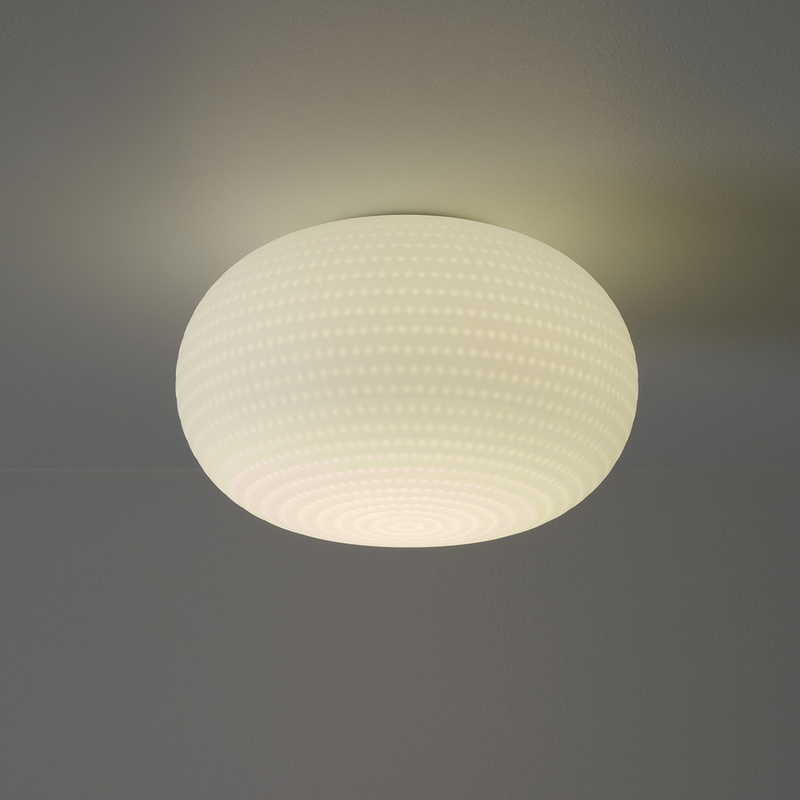 Bianca is a family of luminaires equipped with a fixed-mould blown cased glass diffuser with a milky white satin finish. Mouth blown, belt sanded and dipped in acid to obtain the distinctive 'silk effect' typical of fine glassware, this lamp is worked by FontanaArte according to traditional Venetian production process. 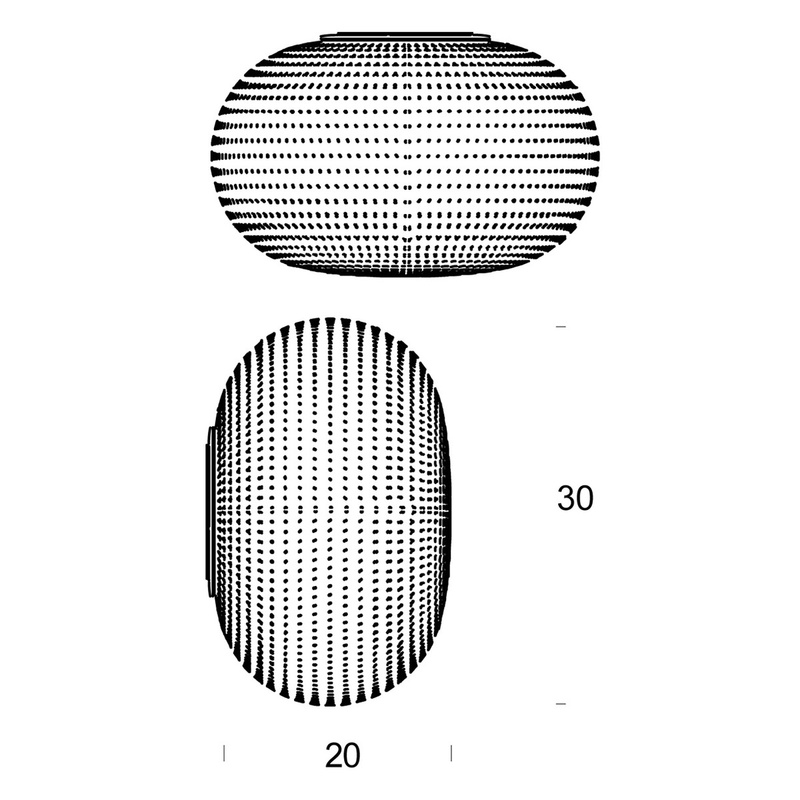 According to this technique, each piece is worked by relying solely on the glassblower's skill and lung capacity, without any external aids for turning and shaping the glass blob inside the mould. Swedish designer Matti Klenell has developed over the years his own and unique language as a glass artist with several solo exhibitions and public art commissions. The broad variety of projects with a mix of art, craft and design is also what characterizes his work. This process has created a personal, innovative, and new take on the Scandinavian design tradition, resulting also in numerous awards such as the Excellent Swedish Design diploma, the +1 award and the German Red-dot design award. 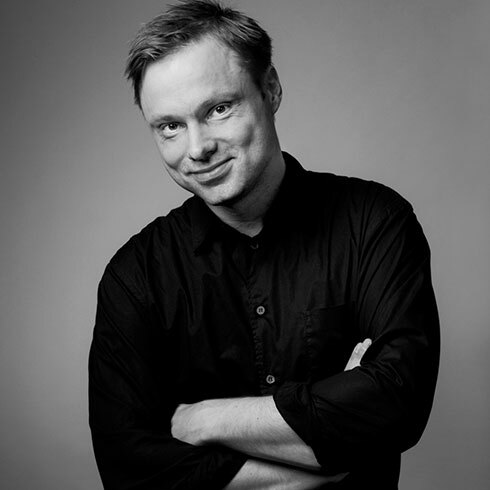 In 2003 he was awarded the Ljunggren Design Prize. The work of Matti Klenell is also found in several museum collections in Sweden and abroad. 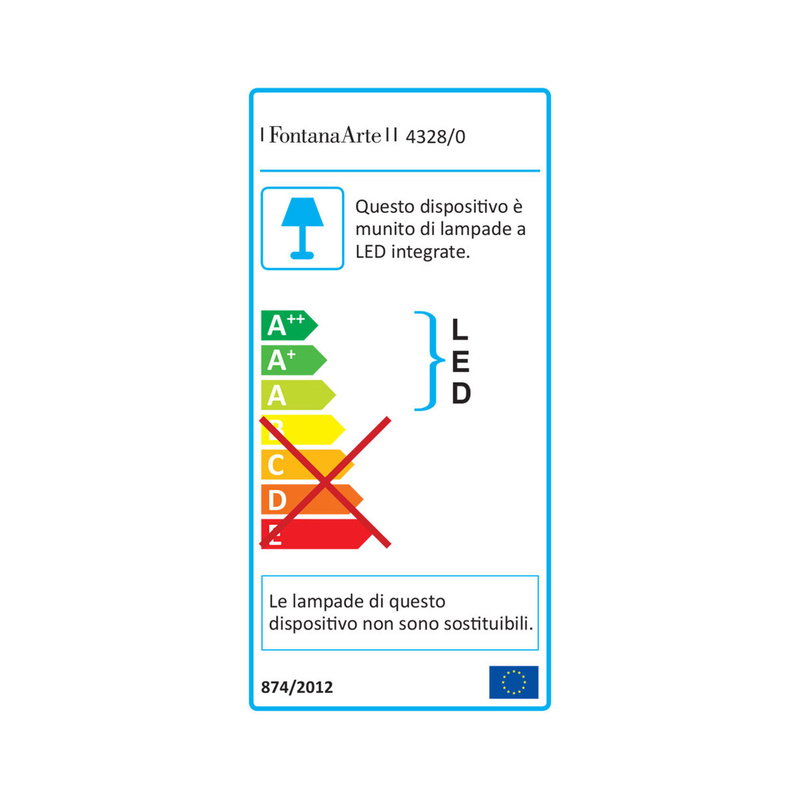 Technical information: included bulb type 17,5W Led (2700 K; CRI>80, 1650 Lm). Matti Klenell (b. 1972) is a Swedish designer who has innovatively reformed the Nordic concept of unity of form and function. He graduated from Stockholm's Konstfack in 1999. Klenell approaches each design project as a unique task. Besides industrial design, he has held private exhibitions of unique pieces, most recently at Galleri IngerMolin in Stockholm in October 2011. Klenell also participated in an international glassblowing workshop and conference organised by Aalto University in Nuutajärvi in the autumn of 2011. The latest display of Klenell's glass design is the Lempi drinking glass he designed for Iittala, which received the red dot product prize in 2012. Matti Klenell has received numerous awards for his work. His design work also includes furniture and lighting fixtures; his customers include BRIO, Moooi, Muuto, Källemo and Bals Tokyo.